BT today announced plans to transform its BT TV service over the coming months, introducing a new, image-rich user experience with easy access to channels and on demand content, and a new BT TV App. The ‘next-generation’ service will enable customers to manage their recordings and stream live and on demand programmes on mobile devices, providing a seamless TV experience in and out of the home. BT will also start showing boxing on Saturday nights from early 2017, in a new partnership with BoxNation. And BT Sport will further enhance sport fans’ viewing experiences with the launch of Dolby Atmos sound, which is planned to be available to BT Sport Ultra HD customers in January. Through these developments, BT is again leading the way in TV innovation, providing its customers with premium content and features usually only found in more expensive TV packages. The new BT TV on-screen guide and TV app will be provided as free upgrades across all of BT TV’s packages - even ones costing as little as £3 a month – giving even more value to TV consumers in the UK. All BT Sport customers will gain access to top level boxing events from early 2017, with the BoxNation channel being made available for free to BT Sport subscribers. 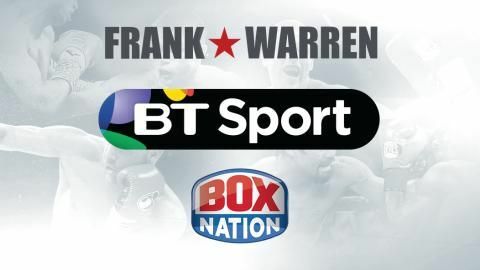 At least 20 Saturday night events, including World, European, British and Commonwealth title fights promoted by Frank Warren, will be shown on BT Sport channels, and boxing fans will also be able to follow their heroes 24/7. BT TV’s next generation YouView TV service will be downloaded to its customers’ set top boxes during early 2017, making it even easier for customers to navigate straight to the programmes they want. Customers will enjoy a faster and slicker experience with easy, image-rich surfing of on demand choices, and will be able to find their way around much more intuitively. This new look design and usability will be carried through to a new BT TV App launching next summer that will give a seamless TV experience in and out of the home on tablets, smartphones and online. BT plans to be the first UK broadcaster to launch Dolby Atmos sound, adding it to its BT Sport 4K UHD TV packages in January. From this season, BT has doubled the number of sports events broadcast in Ultra HD. Dolby Atmos sound is planned to be combined with Ultra HD for select events to deliver the most immersive experience possible, allowing customers to feel as if they are in the stadium. This will be available for no extra cost with BT TV’s Total Entertainment pack. “BT’s mission has always been to provide a high quality, premium TV service at prices that give unbeatable value to UK consumers. We will keep driving the pace of innovation in content, broadcasting and our customers’ experience. “In 2017 we’re going to further shake up the market by releasing our new viewing experience across our TV guide and on demand, our new TV app and on our BT Sport channels, provided as a free upgrade for our customers.